What’s New for Business Payroll This Year? 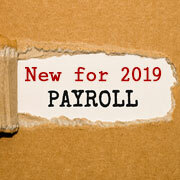 Home / Blog / What’s New for Business Payroll This Year? Tuesday, February 5th, 2019	/	:Blog, Payroll, Payroll Taxes, Workplace Productivity / :qtheagency /	Comments Off on What’s New for Business Payroll This Year? Now that W-2s and 1099s for the 2018 tax year have been sent to employees and the IRS, it’s time to think about 2019 and the changes you need to make to ensure compliance with federal payroll regulations. Although not an exhaustive list, the following describes six developments that affect small- to mid-sized businesses. 1. FICA tax. Under the Federal Insurance Contributions Act (FICA), employers are required to withhold employees’ payroll tax and to pay an equal amount to the IRS as the employer’s share. FICA tax is comprised of the Old Age, Survivors and Disability Insurance (OASDI) — commonly referred to as Social Security tax — and the Hospital Insurance (HI) tax. The OASDI tax is adjusted annually. For 2019, a 6.2% tax applies to Social Security wage bases up to $132,900 (an increase from $128,400 in 2018). A 1.45% HI tax that applies to all wages remains unchanged. Therefore, if an employee earns $150,000 in 2019, both the employee and the employer each must pay a total of $10,414.80 in FICA tax (6.2% of $132,900 + 1.45% of $150,000). 2. Minimum wages. The federal minimum wage rate for 2019 remains at $7.25 per hour, despite calls for an increase. The push for a $15-an-hour minimum wage by some lawmakers didn’t make it past Congress in 2018. However, employers in 18 states are required to raise minimum wage rates at the start of 2019. Eight of these states — Alaska, Florida, Minnesota, Montana, New Jersey, Ohio, South Dakota and Vermont — automatically apply cost of living adjustments (COLAs) to wages. The remaining 10 states (Arizona, Arkansas, California, Colorado, Maine, Massachusetts, Missouri, New York, Rhode Island and Washington) enacted new legislation that dictates a minimum wage. Other states with increases taking effect in 2019 are Delaware, the District of Columbia, Michigan and Oregon. The limit on 401(k) plan deferrals increases from $18,500 to $19,000. The catch-up contribution limit (for those age 50 and older) remains at $6,000. These deferral increases also apply to 403(b) and 457 plans. The maximum dollar amount allowed for additions to a defined contribution plan increases from $55,000 to $56,000. The maximum annual dollar benefit for a defined benefit plan increases from $220,000 to $225,000. The maximum amount of compensation that may be taken into account for qualified retirement plan purposes increases from $275,000 to $280,000. The dollar cap for contributions to a SIMPLE plan increases from $12,500 to $13,000, and the catch-up contribution limit remains at $3,000. 4. Health insurance plans. The Tax Cuts and Jobs Act (TCJA) eliminates the health insurance mandate for individuals under the Affordable Care Act (ACA), beginning in 2019. But the requirement remains for employers with 50 or more full-time and full-time equivalent (FTE) employees. Smaller businesses may choose to provide coverage. According to recent survey results by HR consultant Mercer, in 2019, health insurance cost increases for businesses are expected to slow down slightly and employee expenses are projected to remain relatively stable. Mercer estimates that employers making plan changes will spend on average 4.1% more per employee in 2019 over 2018. For their part, employers estimate that costs will increase by 5.3%, even without making any plan changes. 5. Transportation benefits. Many employers offer transportation fringe benefits to employees, including use of mass transit passes, van pooling and parking privileges. These benefits are tax-free for employees, up to a set monthly amount. The limit for 2019 is $270 per month, increasing from $260 in 2018. However, the TCJA repealed the employer deduction for paying or reimbursing transportation fringe benefits, beginning in 2018. Just recently, the IRS issued interim guidance (Notice 2018-99) for valuing such transportation benefits. Employers should talk with their tax advisors concerning implementation of the new rules. 6. Unemployment taxes. As with FICA, the tax rate under the Federal Unemployment Tax Act (FUTA) remains unchanged from 2018. The FUTA tax rate is 6% on a wage base of $7,000. However, most employers qualify for a credit of 5.4%, which effectively lowers the FUTA tax rate to 0.6%. Only employers pay FUTA tax, making quarterly deposits. Of course, states also impose unemployment taxes. Depending on the state, rates may be different in 2019 due to state law changes (as in Oregon and Washington), or due to claims history. States may use the $7,000 FUTA wage base or establish its own. Your payroll tax advisor can provide more information about the law in your state. Considering the number of moving parts involved, it can be difficult to stay up-to-date on the latest payroll numbers. We’ll keep you informed.